You are at:Home»Herbs»Boerhaavia diffusa Linn. Latin name : Boerhaavia diffusa Linn. Description : The plant is analgesic, anthelmintic, antiinflammatory, antiviral, bitter, diaphoretic, diuretic, emetic, expectorant, laxative, rejuvenative and stomachic. Useful in oedema, biliousness, diseases of the nervous system and in heart diseases and piles. Also useful in asthma, anaemia (particularly during pregnancy), hepatitis, ascites, scanty urine, kidney stone, rheumatism and insomnia. 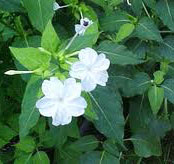 It has aslo been widely used for the treatment of dyspepsia, jaundice, enlargement of spleen and abdominal pain. Recommended Dosage : 5 to 10 g powder of dried root. Contraindication : This herb is probably contraindicated for persons with low blood pressure. This herb has also demonstrated myocardial depressant activity and should therefore not be taken by anyone with heart failure or those taking heart depressant medications unless under the direction and care of a qualified health care practitioner. Large doses may result in vomiting.